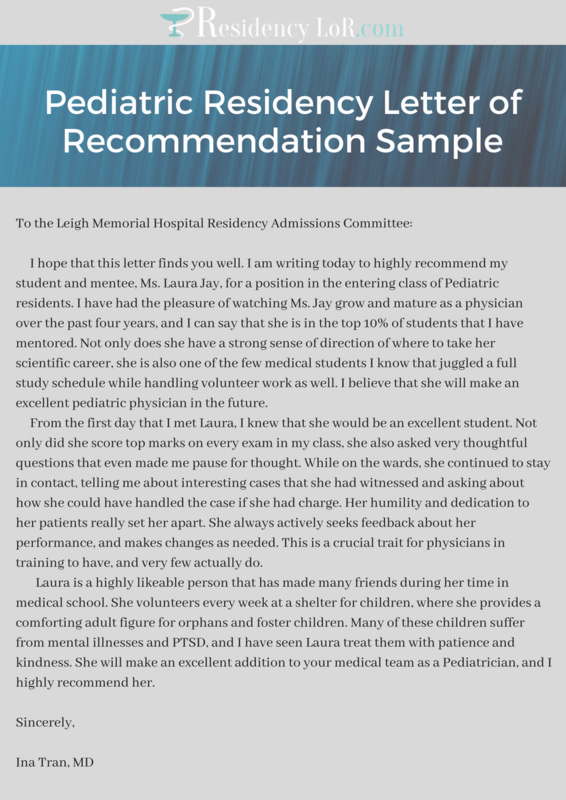 The pediatric residency letter of recommendation sample is one of the best tools to use if you want to know how to write a great LoR. When applying for residency, the applicant is asked to submit a LoR as one of the requirements for consideration of the committee. For that, the psychiatry residency letter of recommendation sample and surgery letter of recommendation sample help. To learn more about why using a sample is a great idea as well as pro tips in writing your LoR, check out the following sections. With the pediatric letter of recommendation sample or surgery letter of recommendation sample, you will have a better idea on how to create the best letters of recommendation, especially if you have to come up with at least one because you’re requested by some of your students to be their recommender. It is both an honor and a challenge to become a recommender. For one, it means that the student is entrusting you his fate in the admission. Second, it is also a challenge for the sense that you have to put your best foot forward to provide the best help that you could in helping him stand out and make it to the program. The letter of recommendation samples for pediatric residents is your help with the ideas they contain in outlining and writing the letter. Choose from our wide range of pediatric surgery samples on this site for the best results. 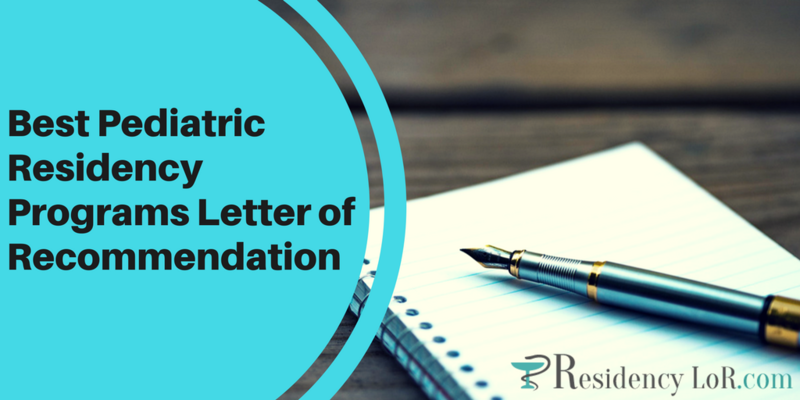 As you can notice in our sample pediatric residency letter of recommendation, the strongest letters need not be long. They must include the most important parts, including the introduction with details about “in what capacity” have you known the applicant. Are you his supervisor, professor or mentor? In the next paragraph, write about your assessment regarding his abilities, performance, and quality of work. In the last paragraph or conclusion, you must be able to summarize the overall strength of the recommendation. Make a precise letter of recommendation. In some cases, the length may indicate how well you know the student. The best letters can go as long as two pages. In writing the letter, you must include specific examples and descriptions of the abilities, knowledge, and skills of the student. However, you must avoid writing generic or vague descriptions. For example, don’t say, “Mr. Ben was a great leader for his team”. If making such claim, back it up with facts. For example, “Mr. Ben has led a team of 10 researchers that have successfully completed a breakthrough study about modern pediatrics in six months”. Just as in all types of writing, you must show, not tell. To make an even stronger letter of recommendation, you may also want to include statistics. Was the student among the top 10% of the students that you have worked within the last two years or so? Write it. If you’re writing about any weakness, although not advised, you must be able to frame it positively. For example, “Mr. Ben has demonstrated improvement in documentation of patients…” not something like “Mr. Ben demonstrated very poor documentation skills”. You may also include any position titles, such as NY Hospital Pediatrics Director, or any faculty appointments. You can include those in the signature section. However, make sure your signature is real, not a digital one. Using a letter of recommendation pediatric residency sample is a great help in coming up with an awesome LoR. But then, before writing and using one, you should collect information, according to Alison Doyle. You should ask the person a copy of his CV before writing the letter. It may also help you review his cover letter, if he has one. These rules also apply for students applying for residency, not only for employees seeking for a new job. By remembering these pro tips, you will not only be able to show that the student deserves his high MCAT scores, but also his fitness for the program and readiness for the career. There you have a complete guide in completing a great recommendation letter that will make the student shine above the rest. 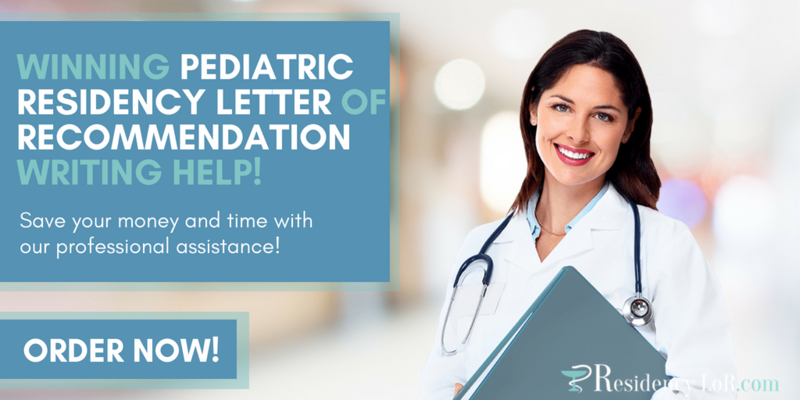 If you’re looking for more help, then you can check out our pediatric administrative assistant letter of recommendation samples or SLoR letter examples. Our team of experts can provide you with awesome letters of recommendation and samples. As you may know, it is not only the student’s AMCAS MCAT scores that matter for the screening committee but also the letter of recommendation to show them that he’s a strong candidate for the residency. We’ve helped thousands of students with our complete suite of services, including personal statements, statements of purpose, CV, resume and letters of recommendation. With us, you can be sure of the best results because we have a seasoned team of writers coming from different medical disciplines including pediatrics. Get in touch with us for help and pediatric residency letter of recommendation sample today!